Oracle cards are a wonderful way to receive guidance on issues that might be troubling you. Even if nothing is troubling you, oracle cards can help you focus your energy and receive messages from your guides, the angels, or your higher self. With some practice, you can build your skills and confidence to give highly accurate readings for yourself and others. Oracle cards, sometimes called “Angel” cards, since many of them focus on working with the angelic realm, are similar to tarot cards, but much simpler to use. They are a divination tool, much like crystal balls and pendulums. Oracle cards work by making use of the Law of Attraction, which means that where you are currently at energetically will attract the cards that have the messages appropriate to you and the question you are asking. There are many types of oracle cards on the market, some of the most popular ones being those created by Doreen Virtue. These cards have beautiful artwork, mostly of angels, fairies, goddesses or other higher-vibrating beings. They always have loving messages, unlike the tarot, which contains cards such as the Death card that have negative associations, though the Death card does not actually mean impending death. To prepare the cards for a reading, select the deck of cards with which you would like to work and clear it, then program it for use. This means that you remove unwanted energies that may be clinging to the deck and infuse it with the intended outcome that you desire. Clearing the deck is mandatory if someone else has handled your cards or if you have been giving readings with them and their accuracy is starting to degrade. I clear my cards after every time I use them with another person, whether that person has handled the cards or not. Most decks have instructions for clearing them, so you can follow those instructions, or use the following method, taught by Virtue in her books, card guidebooks, and courses: hold the cards in your non-dominant hand (for most people, that’s the left hand). With the dominant hand (the one with which you write), knock on the cards using your fist to shake off any unwanted energies that may be clinging to the deck. Go through the deck and touch each card to make sure that your energy is on it. It’s not necessary to touch the whole card. Touching just one corner will suffice. Next, fan out the cards and hold them to your heart. Hold them with the message sides facing you. Say a prayer or set intent for the cards, asking that your readings be accurate and relevant to the person getting the reading. Ask that you be able to clearly receive messages from your guides and angels and that you can stay in integrity throughout the reading. If you already work with the angels, you will know that you can call on Archangel Michael for protection, guidance, and to help you keep the ego out of the way while you read. Make sure you remember to put up psychic protection around you to ensure that you connect only with high-vibrating energies during the reading. To start the reading, connect to your guides, or, if you’re doing an angel reading, then connect to your guardian angels or the angel with whom you typically like to work. If you are reading for someone else, then you can also connect with his or her guides and angels. 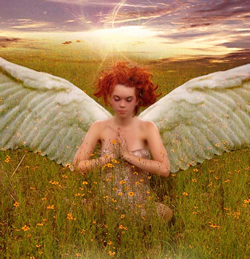 I have found that connecting to the other person’s guides and angels, with permission, helps boost the accuracy of the reading and increases the number of messages that come through. Once you have made the connection, then ask a question. Most readings are about health, career, relationships, or finances. Sometimes, a person doesn’t know what to ask, so then it is okay to just ask the angels to give you a message that they would like you to know. To do this, you can simply just ask, “What would you like me to know today?” Avoid asking yes/no questions. Those types of questions can be answered by using a pendulum. The cards are better suited to open-ended questions. Focus on the question as you shuffle the cards. When you are guided to stop shuffling, then lay out the cards in a format of your choosing. The most basic layout is the three-card layout, where you place three cards in front of you, face up, and read them from left to right. The left-most card typically represents the recent past, the middle represents the present, and the right-most card represents the near future. The instruction booklet for your deck may provide alternative layouts and some can get fairly intricate. For a very simple and quick reading, pull one card after asking your question. This gives you a starting point for resolving your issue or answering your question. The layout of the cards determines the order you read the cards, but generally, you read the cards from left to right for a horizontal layout, and top to bottom if the layout is vertical. While the cards do come with guidebooks that provide meanings for each card, and it is okay to consult the book when you are starting out, the idea is to begin to rely on your own psychic abilities and intuition when you do a reading, rather than depend on the booklet. Study each card to see what symbols, colours, or lines jump out at you. As well, use all your psychic channels of clairvoyance, clairaudience, clairsentience, and claircognizance to receive additional messages from guides and angels. Your readings will improve with practice. If you are reading for someone else, do not try to interpret the messages you receive. Simply inform the person what you are getting. If you try to do more than just describe, you may miss the real point of the message. For example, if you are shown a hockey stick, let the person for whom you are reading know that you see a hockey stick. Unless the message also makes it clear that the person was a hockey player, you do not know if the hockey stick represents a love for the sport, actually playing the sport, or is an autographed piece of memorabilia that the person treasures. You can ask for further clarification from your guides, and get the significance yourself psychically. Most people will verify the significance of the message for you, but if they don’t, that is their prerogative. Some people prefer not to share intimate details with you, others are skeptics trying to test you and don’t want to reveal anything, and others simply have their own reasons for not wanting to share. That is okay. Most people, though, get very excited when you tell them something you couldn’t possibly have known and willingly share the significance. Leave it up to the individual to decide. Your ego wants constant validation, but you don’t have to have it to give good readings. It is okay to practice with family and friends, but it is much easier to read someone you don’t know very well. If you read family and friends when first learning how to do readings, it is too easy to doubt the messages you receive, because it is difficult to distinguish if you are receiving information or drawing on existing knowledge. However, you can’t possibly know everything about everyone, so ask your angels/guides to give you messages that will help the person and give them the information that he or she needs. Virtue recommends that “if you get nervous, focus on service.” This was something she reiterated in the courses she taught that I attended, and also in her books and in some of her Oracle card guidebooks and cards. When you focus on serving, you put the focus where it should be: on helping the person and not on your performance. Sometimes a person will have more than one question, and you can do as many spreads as you like within one reading. However, there will come a point when you know it is time to stop the reading, whether that is because the agreed upon time is up, or you just feel the energy that carries you through the reading change or dissipate. When you know it is time to conclude the reading, thank all the guides and angels that helped you with the reading and disconnect from them. It is also very important to disconnect from the person you were reading, if you are reading someone else. If you do not disconnect, then you may find that person intruding on your thoughts throughout the day, or you may feel unfocused and have difficulty concentrating. Disconnect by setting the intent to disconnect, and then physically chopping through the air between you with your hand. Virtue teaches the chopping method of disconnecting in her courses, and I find it to be one of the simplest methods. Oracle cards are a useful tool for accessing divine guidance from your spirit guides and guardian angels. If you are having difficulty with an issue and require such guidance, doing a card reading for yourself can help you gain clarity and insight. A card reading is also something that anyone can do. But it does require consistent practice, not only in reading the cards but also in recognizing how you receive your psychic messages. Disclaimer: The information contained in this article is for educational purposes only and should not be used for diagnosis or to guide major decisions or treatment without the opinion of an appropriately trained professional. Any reader who is concerned about his or her health, career, relationships, or finances should contact a qualified expert for advice. Virtue, Doreen. Angel Therapy Oracle Cards Guidebook, California: Hay House, Inc., 2008.